Some of the beautiful student work on display, showing the type of projects covered in CVSW courses. Last Saturday I represented the Society of American Period Furniture Makers at Bob Van Dyke's Connecticut Valley School of Woodworking. 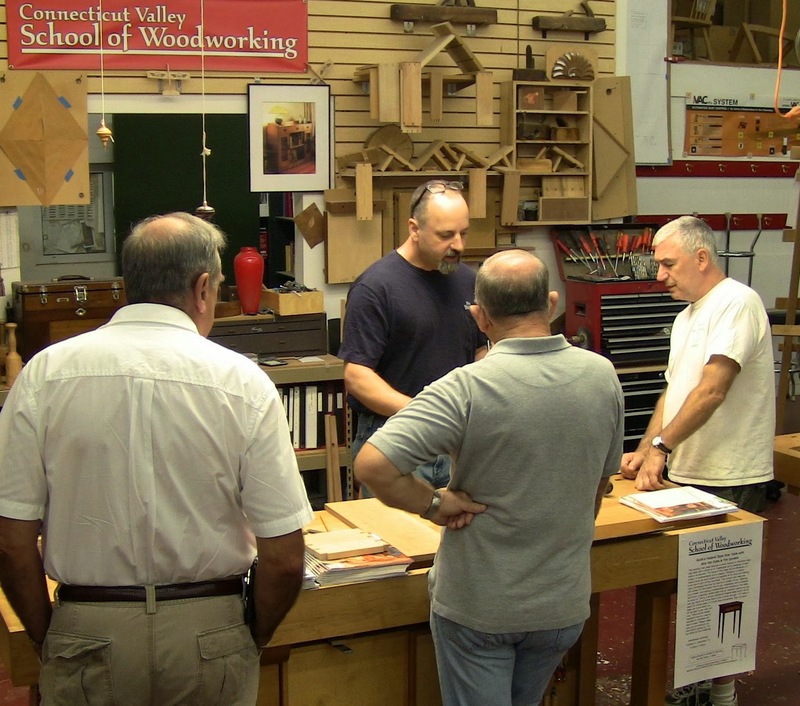 This was their combined Open House and Lie-Nielsen Hand Tool Event. 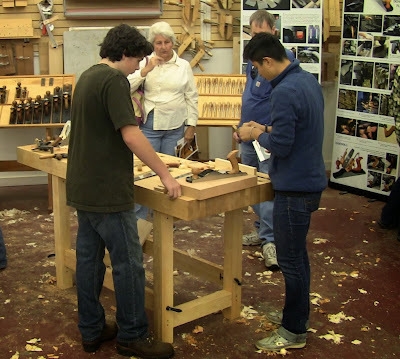 For the Open House, Bob had a display of student work and instructors doing demonstrations. There were also several local vendors and used tool dealers. The Hand Tool Event was setup in the other half of the large main classroom. It was a gorgeous fall day, so rather than trying to cram everyone inside, the dealer tables and several demonstrators were setup outside in the back parking lot. That's where I had my bench. It clouded up and started to sprinkle mid-afternoon, so most of the dealers packed up for the day and I moved inside. I spent the day doing a variety of random demonstrations as people came up and asked questions. As always, I encouraged people to try out the tools. I showed rough stock breakdown on the sawbench, resawing with a ripsaw, sawing out curves with a bowsaw and turning blade, shaping a cabriole leg with spokeshave, gouges, and rasp on my Al Breed carving vise, sharpening chisels on my portable sharpening station, sharpening and using a card scraper, squaring and flattening stock in preparation for dovetails, and making half-blind dovetails. Since I need more practice with the latter, I spent most of my time when I wasn't talking to someone doing repeated half-blind joints, cutting them off and doing them again. 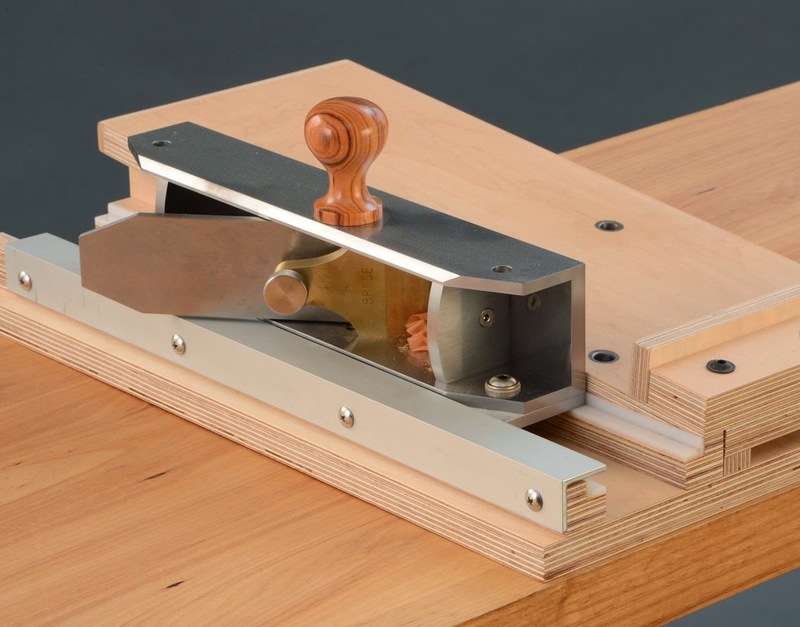 Several woodworking acquaintances said hello, Rick Roberts, Bill Rittner, and Ralph Boumenot, a frequent commenter here (you can read his post on the day here). Nick Kotula told me about the class he's offering on understanding period furniture styles, where he visits the Wadsworth Atheneum Museum of Art and other area museums to examine their exhibits. 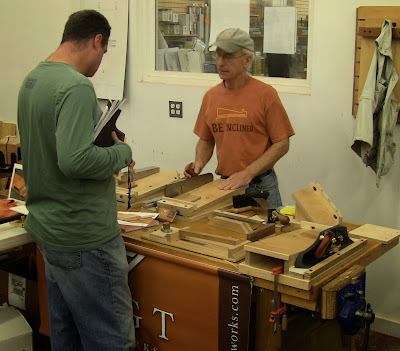 An experienced professional furniture maker, he also offers other classes in design and properties of wood. If you're interested, you can contact him at 860-243-1646 or nickolaskotula2005@yahoo.com. Ben Blackmar stopped by to tell me about his new job. 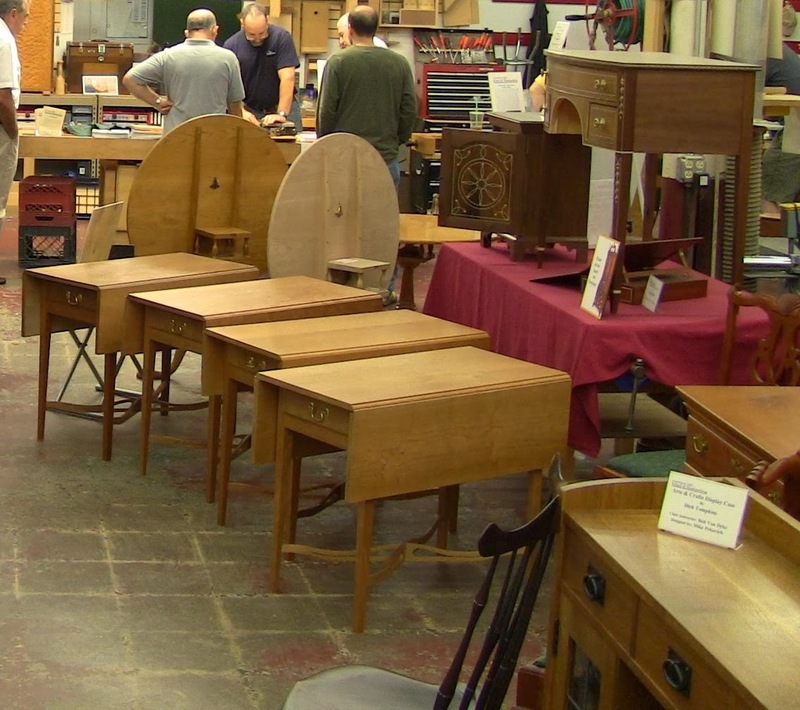 I first met him briefly on a tour of North Bennet St. School in Boston, where he was a student, then later at the Furniture Expo at the New England Home Show. He's not big on fanfare, so I'll just congratulate him and wish him luck. You can be sure you'll be seeing more of him. 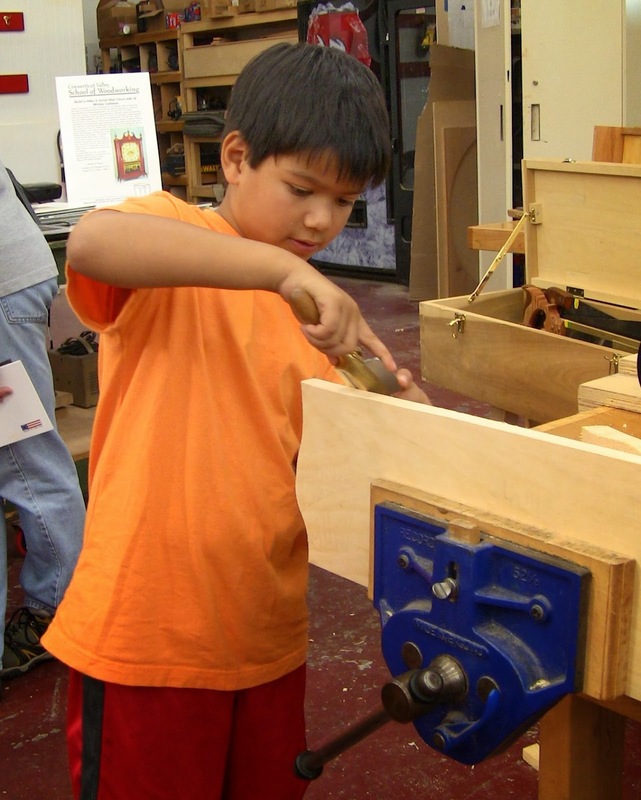 This is Michael, 8 and a half years old, trying out my LN Brian Boggs spokeshave. Everyone loves this tool. He spent about 15 minutes making curls with it, then figured out the mechanical interlock as I made a dovetail joint. I just managed to get pictures of a few of the people demonstrating. There was a lot going on! CVSW instructor Walt Scadden demonstrating blacksmithing. 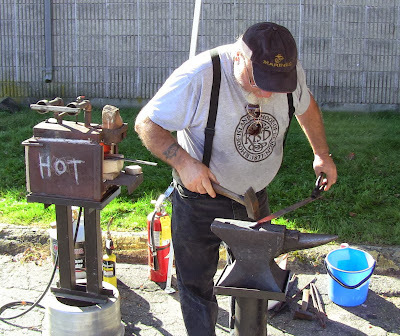 He was the primary blacksmith during the construction of the replica of the historic schooner Amistad at Mystic Seaport. LN demonstrator Michelle, right, shows a young man how to setup a bevel-up plane. 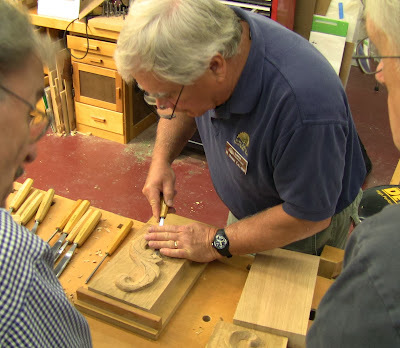 SAPFM Co-founder and CVSW instructor Mickey Callahan demonstrates carving. 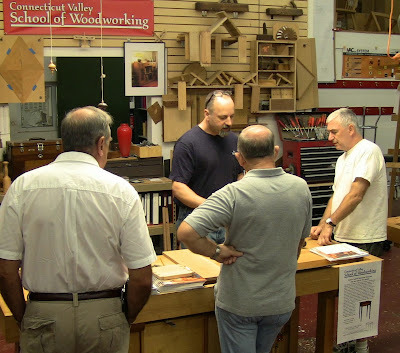 Mike Pekovich, Fine Woodworking magazine art director, also teaches classes at CVSW. Tico Vogt demonstrating his Super Chute 2.0 shooting board with the new No-Rock Runway. As we were packing up at the end of the day, I tried out Tico Vogt's new product. This is the No-Rock Runway, which really does eliminate any chance of the shooting plane rocking in use. This thing is solid, making the Super Chute the Cadillac of shooting boards. It's not yet available on his his website, but will be soon. A Super Chute with No-Rock Runway, and Lie-Nielsen #51 Shoot Board plane setup on the special carriage to match the runway. But planemaker Ron Brese has taken this even further, turning it into the Ferrari of shooting boards. 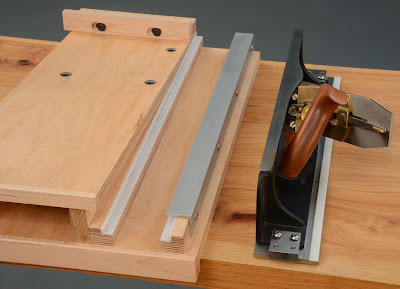 He's designed a shooting plane specifically for this setup, the 125-38 Shooting Board Plane. The combination is absolutely awesome. Wrap the web of your thumb around the handle and your fingers around the body and give it a push; at 10lbs., this thing has the mass to power smoothly through the cut. It feels like a monster with 3/8" steel sole and 1/4" sides, and is appropriately nicknamed the Brute. Ron Brese's Brute on a No-Rock Runway. The photo can't capture the feeling of raw power in your hand as you push it. Great post, wish I could have been there! I wanted to let you know; every post of yours spawns so many tabs - you do such a great job of giving links, than I go to them to get more detail, and they lead to other places... It's like for every post you write, it's like you provide dozens! Thanks for all the learning you so generously hand out! Thanks, I'm glad you find the links helpful!